This is a sponsored post written by me! 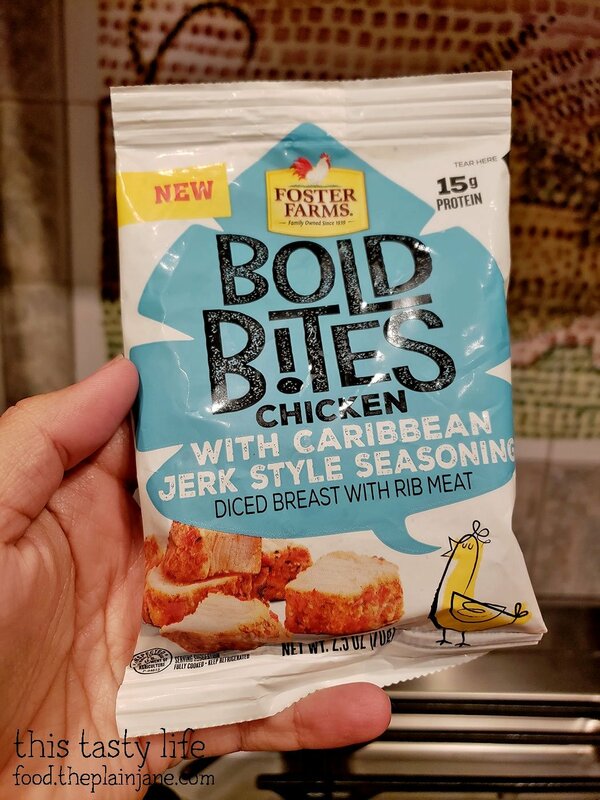 I was invited to try a new product from Foster Farms called Bold Bites. I like chicken and I like trying new things, so why not? The packages were sent to my house and they even included the cute cardboard container for the chicken. 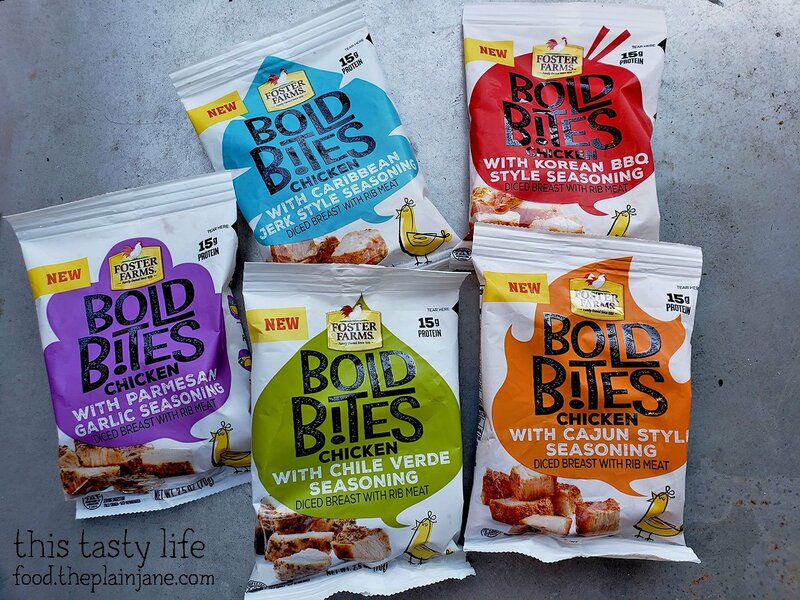 There are five different flavors of Bold Bites chicken. They are fully cooked and all you really need to do it open up the package and use them. They can easily be added to a dish – toss in a sandwich, put it in a quesadilla, add to pasta, or top off a salad with them. 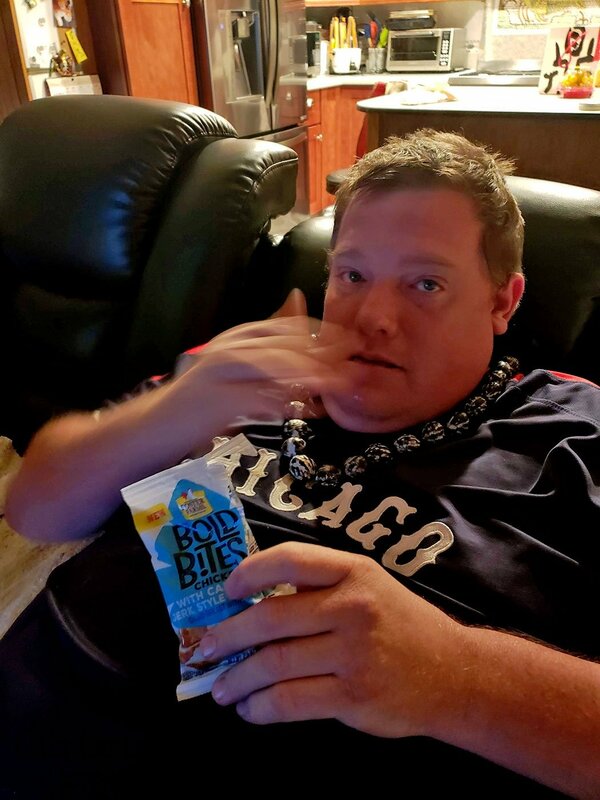 I was really properly into it when I first started sampling the Bold Bites. The first one I tried was the Parmesan Garlic since that one sounded the best to me. 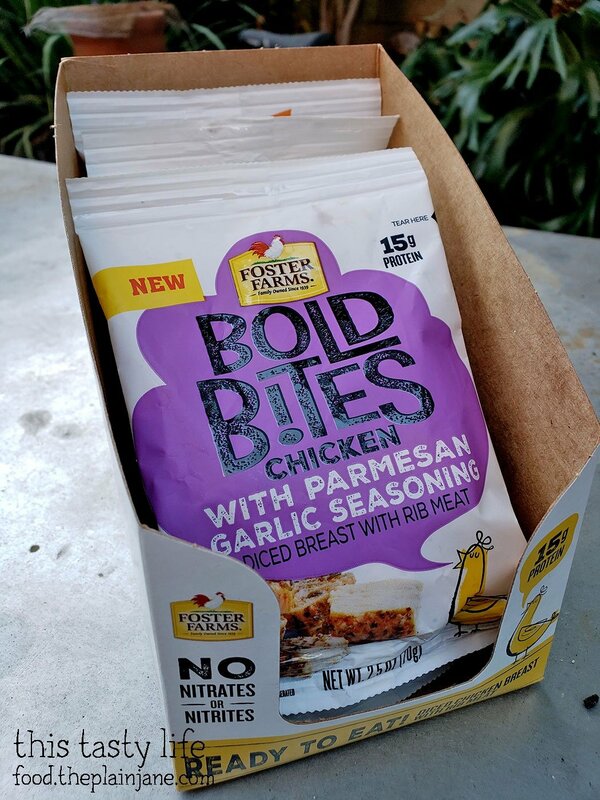 All packages of Bold Bites are 90 calories and 15 grams on protein. They are all white meat chicken breast with a variety of seasonings. For my first tasting of the Bold Bites chicken, I put the chicken on top of a salad with romaine (this was a few weeks ago before the e coli scare! ), carrots, tomato, cucumber, jicama, strawberry, a hard boiled egg, and sesame ginger dressing. 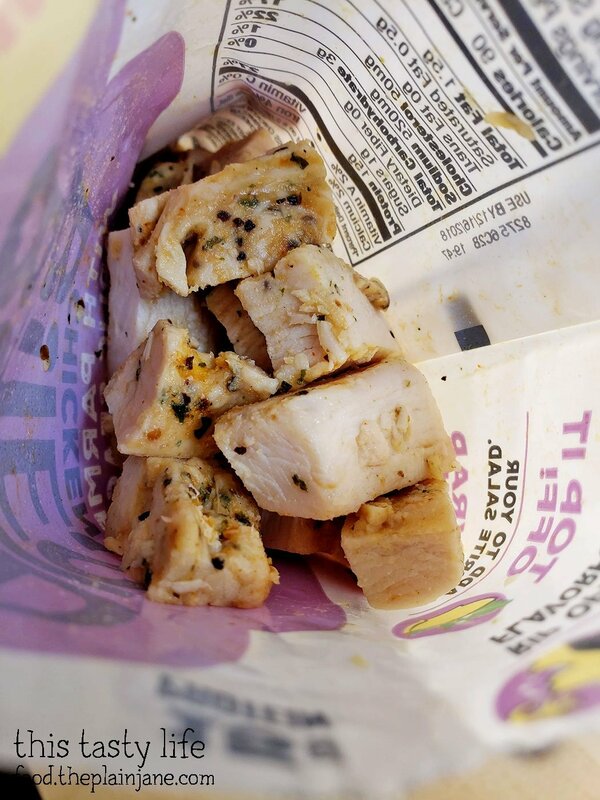 The Bold Bites chicken is juicy and tender. 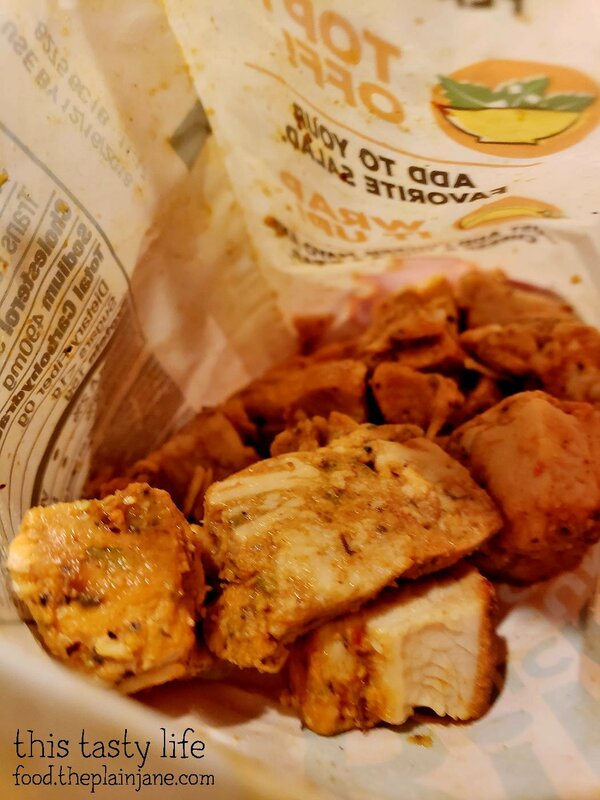 Those bold seasonings are definitely present on the chicken, though overall it tasted more peppery than garlicky to me – maybe that is the “boldness” that is coming through? The chicken is really moist and doesn’t taste overcooked. The texture is pretty soft as well. 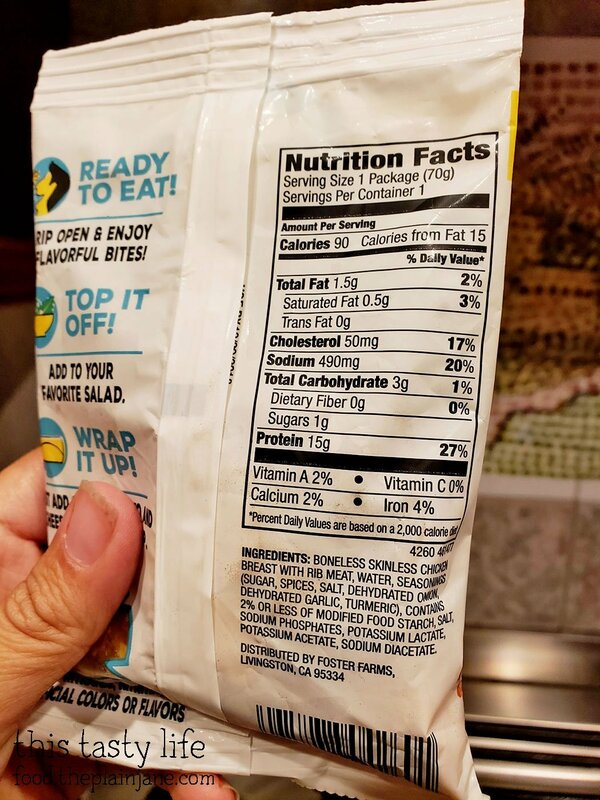 I liked the easiness of the bold bites – I just opened it up and topped it off on my salad and boom! – done. I felt the flavor got a little lost with my choice of dressing but can still detect the pieces of chicken which are tender. It probably wasn’t the best idea on my part to pair parmesan garlic with asian ginger sesame dressing… but oh well. 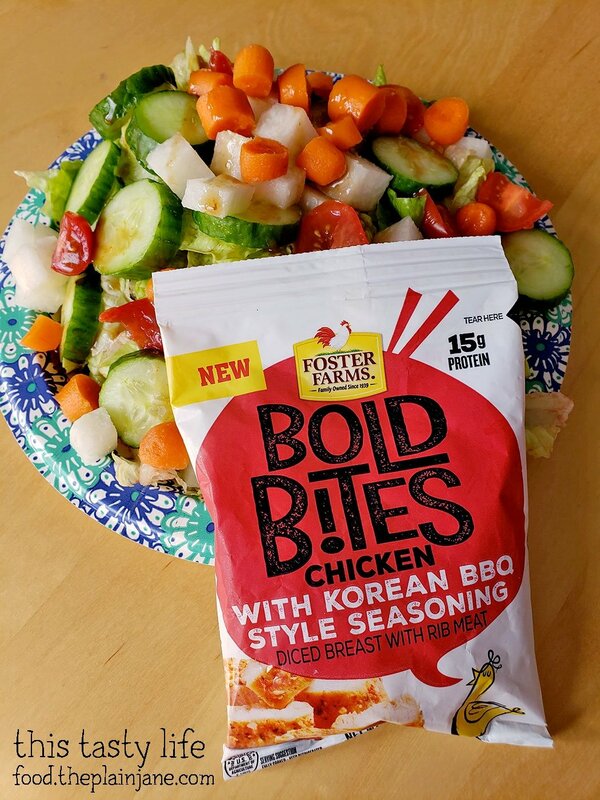 The next Bold Bites I tried was the Korean BBQ Style chicken. Again, you can see I put it on a salad. I meant to do something more exciting with these but I was lazy. Which… actually is kind of a perfect use for the Bold Bites since they’re so easy to use. 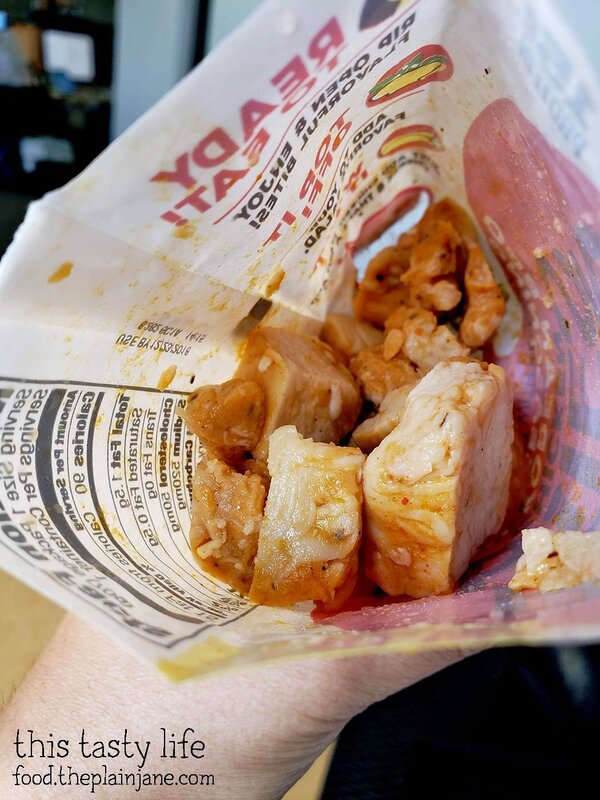 I don’t know if it’s because I paired the Korean BBQ Bold Bites in a salad with Sesame Ginger dressing or what, but the seasoning on this chicken was kind of odd to me and weirdly overpowering. This one was really quite “bold”, as the name suggested. I would be munching along on my veggies, get a piece of chicken, and then go “Whoa. Weird. What is happening in my mouth?” I was half expecting them to be spicy since a good amount of Korean food is spicy, but it just has a hint of heat which might just be perceived on my part since there’s no mention of peppery or spicy seasonings in the ingredients list. Much like it’s counterparts, the Bold Bites chicken itself stays tender and juicy, but the flavor was not one of my favorites. Perhaps in another application where the spice flavor can be mellowed out it would make my tastebuds happier, but on a salad, alas, it was just merely protein for me that I didn’t really enjoy. I started avoiding the rest of the pieces of chicken since I didn’t like the flavor of it. I already knew right off the bat I wouldn’t like the Caribbean Jerk Bold Bites since I have never enjoyed Caribbean Jerk seasoning. I made Jake eat the Caribbean Jerk one. I didn’t even do anything fancy with it. I just gave him the package and he ate it. He thought it was okay. Kind of mushy for chicken. Maya liked the pieces. Like a lot. She loves chicken. I then decided that we should just try the other two that I had left. This one is the Bold Bites Cajun Style seasoning. This one was really bold with strong cajun spices. It was overly bold for me on it’s own, actually. And the last one is the Bold Bites Chile Verde seasoning. I wish I had put this one into a taco or a quesadilla since I think that would be a great application for this one, but we had eaten already and didn’t want a full meal – we just wanted to try the flavors! I would say overall that my favorite one was the Parmesan Garlic, followed by Chile Verde. The Korean BBQ was my least favorite, and the Cajun had a smoky spicy flavor that was a little much for me. And yeah… sorry Caribbean Jerk, I didn’t even try you. Overall I would say that the Bold Bites chicken is good for your lazy days. 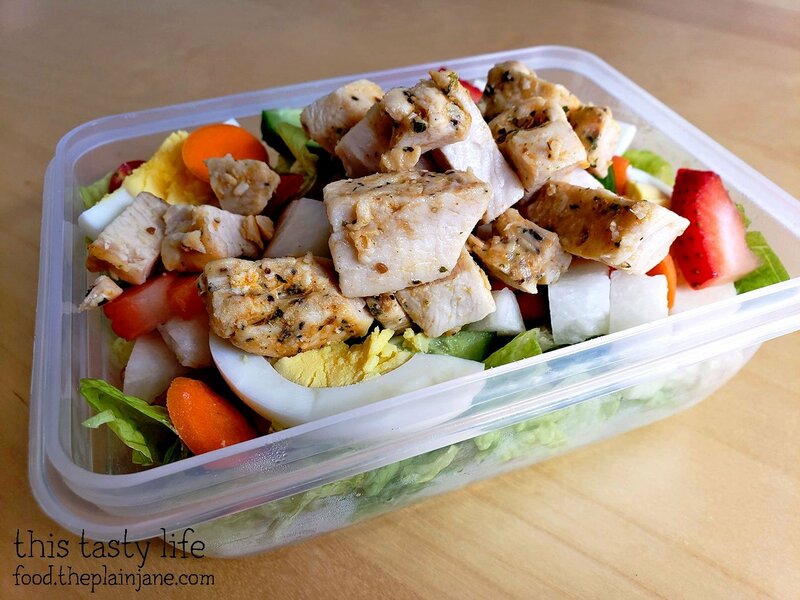 Those days where you want something with flavor, on the healthy side, and packed with protein. You just keep these in your fridge and you don’t have to do anything to use them – just open up the package and you’re ready to go. I did find the chicken to be a little TOO moist – almost too soft and bordering on mushy – with some of the packages of chicken. 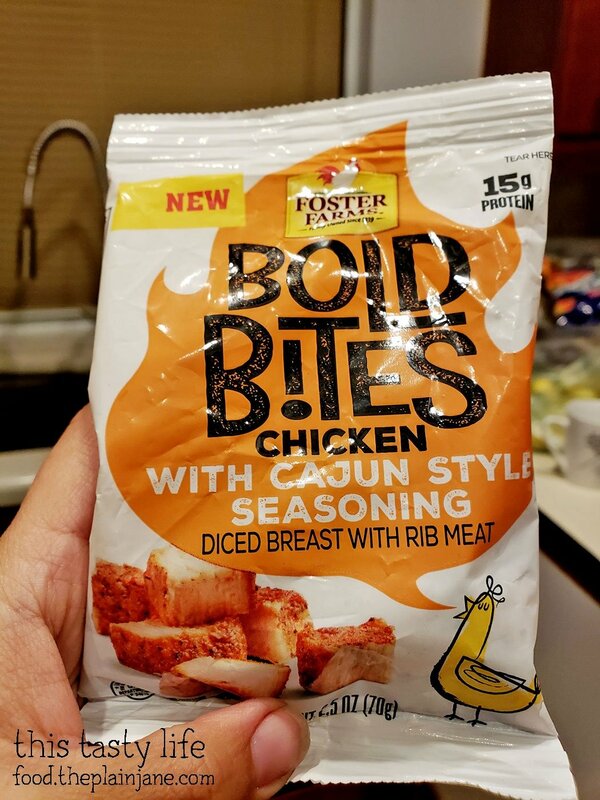 The seasonings on these really are BOLD and have a lot more seasoning than your regular plain old chicken breast so it can really spice up a meal you’re having. I wouldn’t really recommend eating these without something else since the flavor is so ramped up… unless that’s your jam, of course. 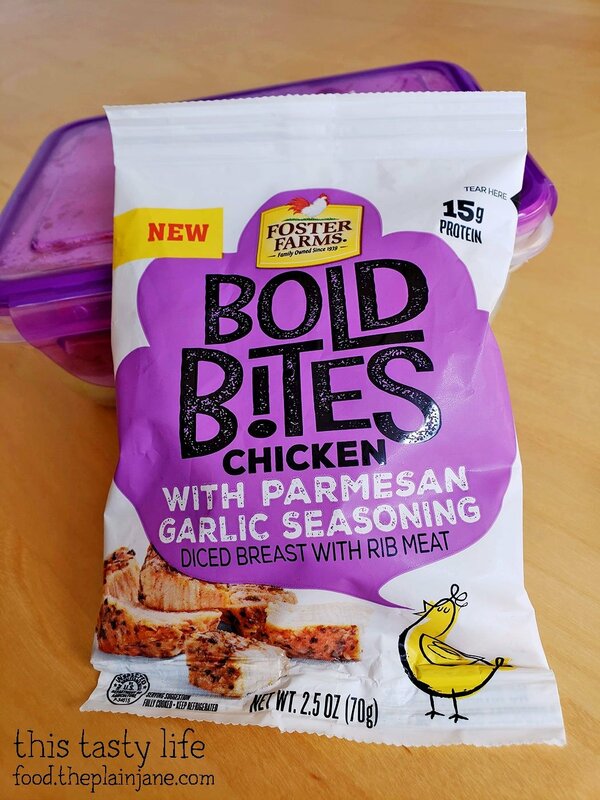 I’ve seen packages of the Bold Bites chicken available at my local Target for $1.99 which is not a bad price point for some ready made, boldly flavored chicken. 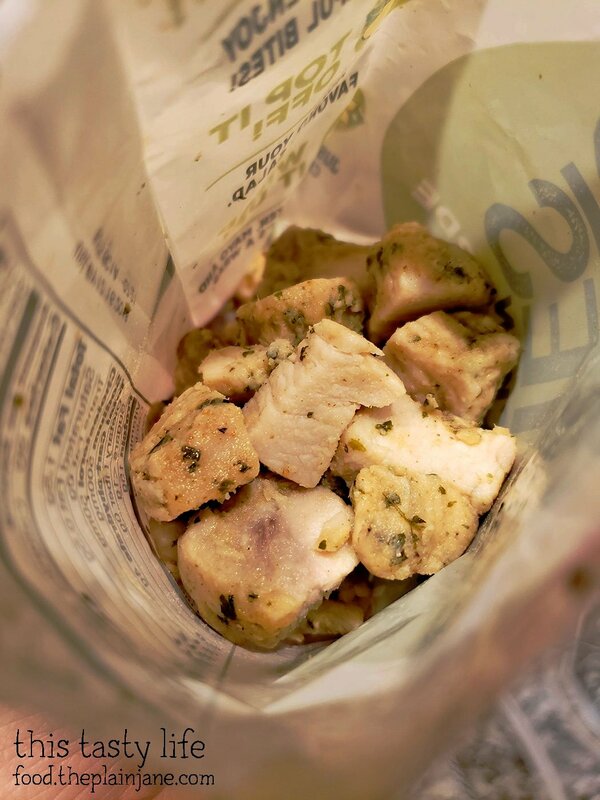 A great pickup for an addition to your lunch when you’re having a “I don’t want to cook” kind of day. Disclaimer: This is a sponsored post. 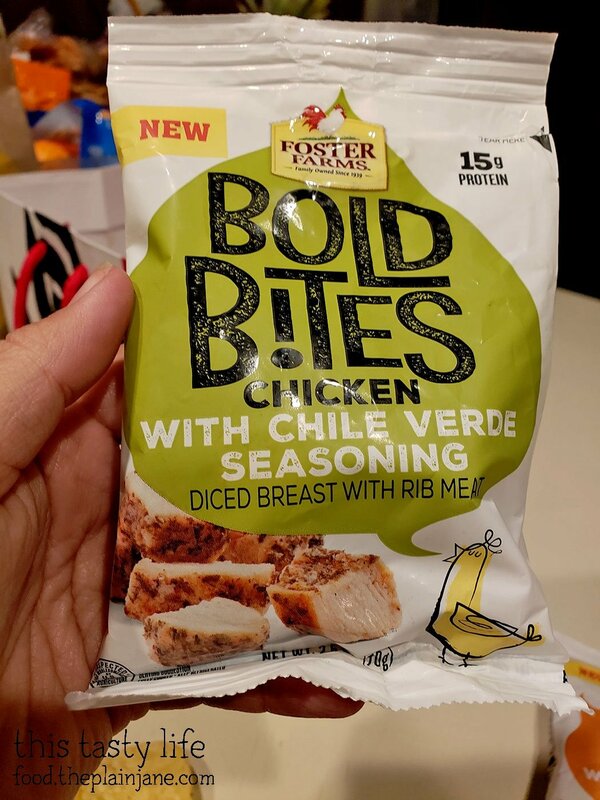 I received complimentary sample packages of Foster Farms Bold Bites chicken and a gift card in exchange for this review. All content and photographs are by me and all opinions stated here are my own. Did you ever find the expiration date on them? 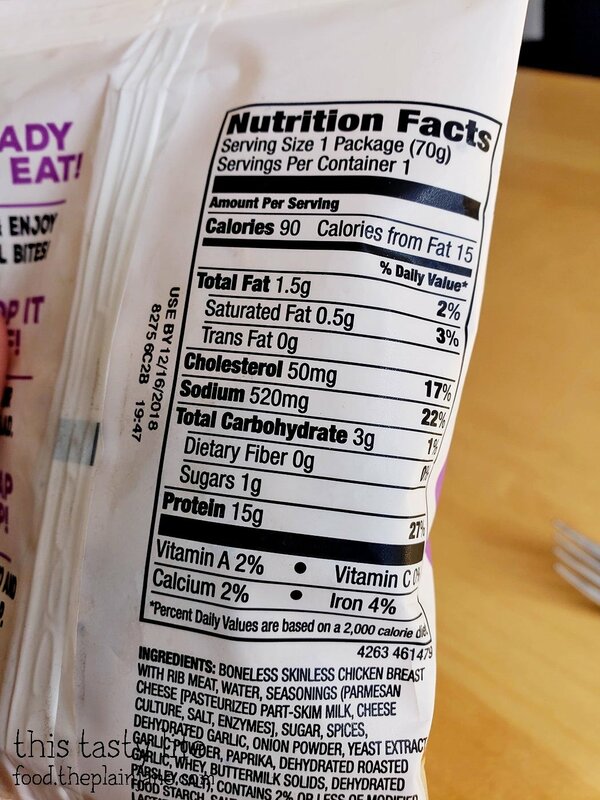 Yeah the use by date is next to the nutritional information.